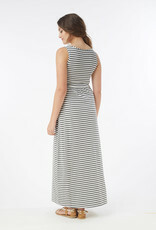 This cotton maxi nursing dress with dark grey and white stripes is perfect for summer weekends or during shoulder seasons paired with a lightweight jacket. Designed for the demands of everyday breastfeeding, this Must Have maxi nursing dress is made of organic cotton - incorporating a hint of spandex for shape retention. Constructed with the empire-line nursing access, the breastfeeding access is discreet and a breeze to use - especially for first time nursing mothers attempting to establish their nursing routine. An indispensable breastfeeding dress for the summer season.